Will my loft/Attic need Planning Permission, is it suitable for conversion & how much will it cost? Do you like your house & love where you live but could do with a bit more space? perhaps a room for the kids or a master suite you can retreat to if so a loft conversion might be the ideal solution! 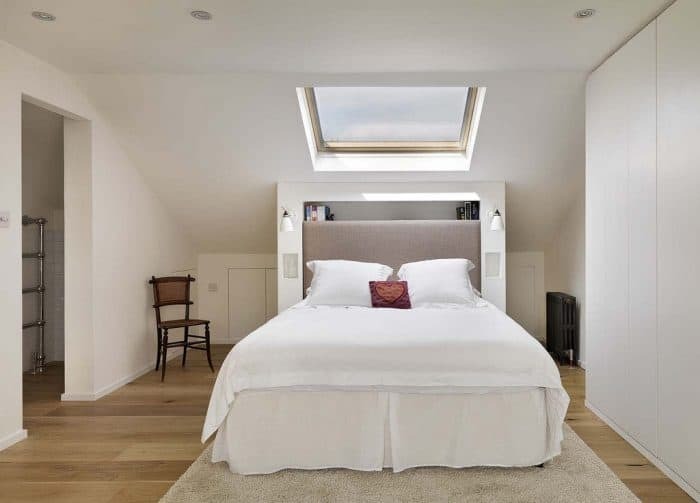 Loft/Attic Conversions come in all shapes and sizes, from a very basic loft conversion to a high-end loft conversion such as creating a luxury master bedroom suite. Undoubtedly you will have lots of questions such as…. Who should I speak to first? How do I know if my Loft suitable for conversion? 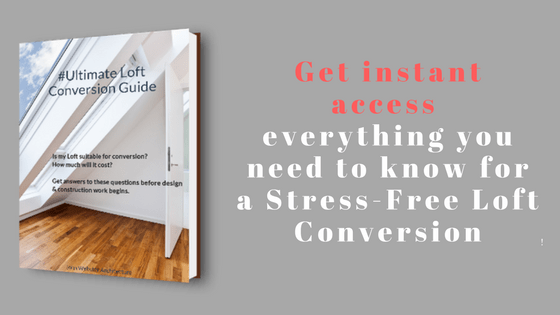 This Guide has been written for you, to help you appreciate the design & construction process of a loft conversion project as well as looking at what permissions are required & how much a loft conversion is likely to cost. Where do I start? & Who should I speak to first? It can be confusing knowing who you should speak with right at the beginning, it might be an idea to speak to a builder, but the builder will generally ask for a set of drawings to assist him. So, while builders at great at building they don’t always know the current building regulations and rely on the Architect to provide this information. Therefore the best place to start is to speak with an Architectural firm that specializes in Loft conversions. A feasibility study will be carried out to ascertain if the loft may be suitable for conversion, this is critical and will save you time and money. This ‘homework’ will pay dividends, there is a big issue in the construction industry of people starting design and construction before they have fully done their research and homework. It only causes cost overruns later if you take shortcuts and don’t establish solid foundations. This is the question your Architect will answer during the feasibility study. At the moment your loft is probably cold and dark and provides a comfortable home for beasties, maybe some pipework or a redundant water tank! It may though be possible to convert it into that extra room or maybe a master bedroom suite you have always dreamed about. This is a lengthy guide but stick with us as it gives you a good idea of what’s involved in a loft conversion project. The good news is that most houses are suitable for a loft conversion although you should be aware that some lofts or attics are easier to convert than others, although it depends on what you have in mind and probably more importantly what your budget is. 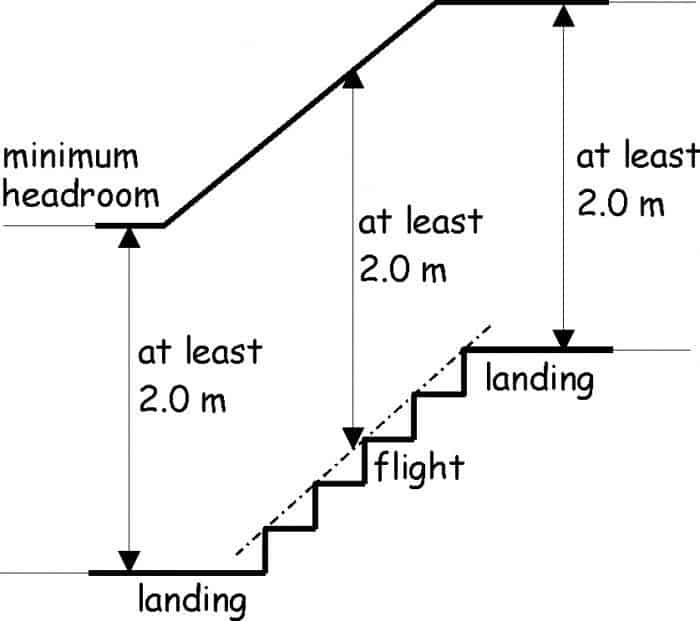 STAIRS – As well as having the required head height on a stair, consideration needs to be given to the location of the new staircase as the space required for a stair can take up more space than you might realize. *Note: 600mm where it serves only sanitary accommodation and/or one room other than accessible sanitary accommodation, a kitchen or an enhanced apartment. 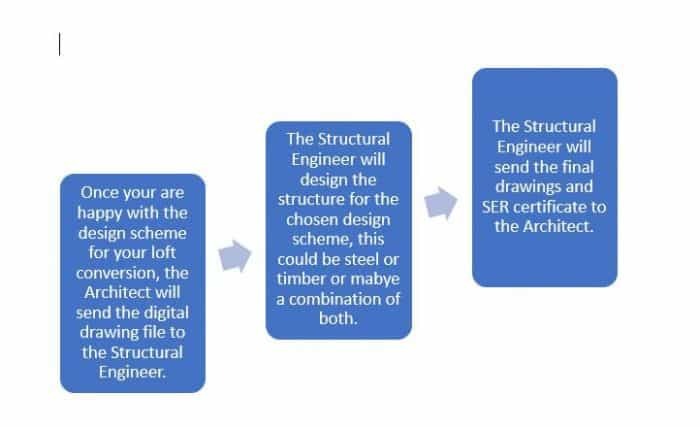 STRUCTURE – Depending on the existing roof structure or how radically different you intend to make things will have a bearing upon the structural design, this can potentially where a lot of the budget gets eaten up. Normally a roof is designed to be just that, a roof! Fine for storing your Christmas tree but generally it is not designed for habitation and all the extra loading that will be put upon it. 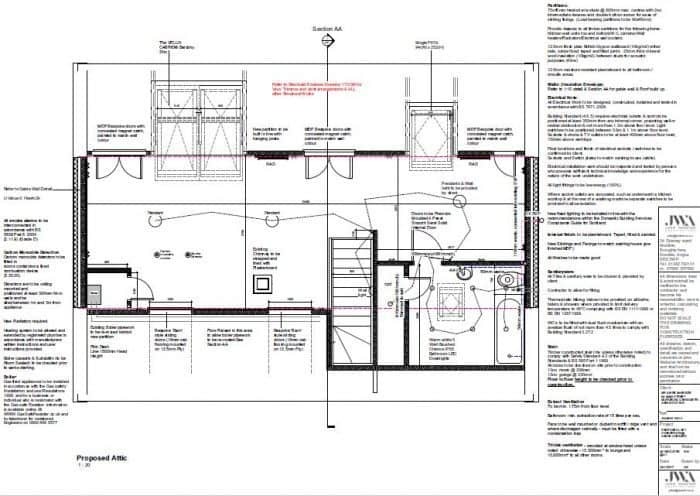 A Structural Engineer will need to be engaged to complete the new structural design for the loft conversion, there is no ‘one size fits all’ solution, each project will be unique so therefore a structural design specific to the project will be required. Fig 1 on the following page shows the process that is followed to give the best results. It might be good to mention to you at this point it’s worth thinking about how much space that you will gain and how much space you might lose! For example, if you need to sacrifice a bedroom to make way for a staircase and you are only gaining one bedroom then you might question the sense of this, but if you must sacrifice a bedroom to create 2 bedrooms & a bathroom then this obviously makes more sense. It’s also worth remembering that a loft conversion might not be for everyone, the floor space is normally good but it’s not all useable because of the sloping ceilings. LOFT CONVERSION TYPE – are you intending to carry out a bungalow loft conversion, a loft conversion to a two-storey semi-detached or detached house or perhaps a top storey tenement loft conversion. A bungalow loft conversion is perhaps the easiest in terms of complying with fire safety regulations (Building standards) which will be reflected in the cost of the conversion. 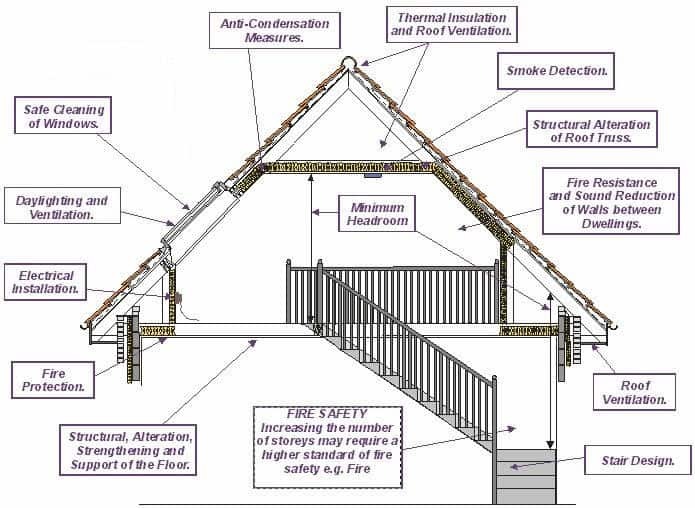 A loft conversion to a two-storey house is a little more involved, appropriate levels of fire separation must be maintained between the two properties (semi-detached), fire protection will also be required to allow a safe passage out of the building for the occupants of the loft, in practical terms this means extra protection to the first-floor ceiling and fitting fire doors. Top floor tenement loft conversions are more complex and require a high level of fire protection such as a sprinkler system if we combine this with working at such height it makes this type of conversion challenging, but depending on what space is available for conversion can still be a worthwhile project. Will I need Planning Permission & a Building Warrant for my Loft for conversion? This depends on what your plans include, you may or may not require planning permission. A basic loft conversion such as the one shown above will generally not require planning permission, however, if your property is in a conservation area or is a listed building you may require listed building consent and Planning permission. If you want to add dormer windows or change the style or shape of the roof you will normally require planning permission. It’s not always black & white, but its too important to make assumptions. Send drawings to planners for pre-planning advice. Get feedback that will determine whether we make a planning application. One of the most important points for you to take away from this guide is to remember to get something in writing whether you need planning or not. If you don’t need planning permission then you can get a ‘certificate of Lawfulness’ this is a legal document to say that the works have been carried out lawfully. At the very least you should get an email from the planners to state that in their opinion no planning is required, however every local authority works differently, some may be happy to provide this, others may not, in this case, it would be a smart move to obtain a ‘Certificate of lawfulness’. 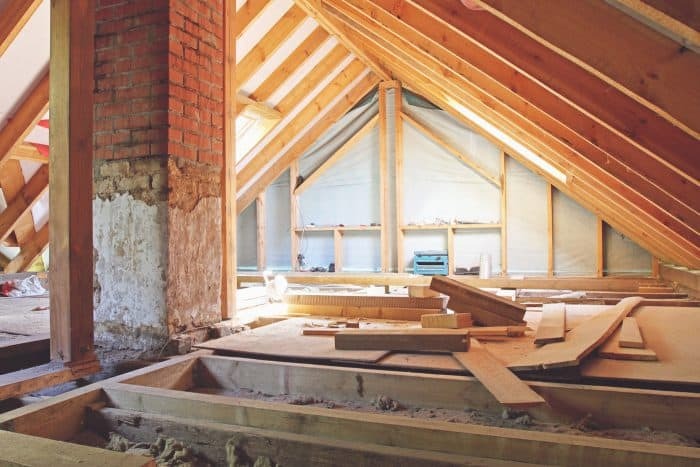 Regardless of whether your loft conversion requires planning permission or not, you will need to obtain a Building warrant for the work that you intend to carry out. The Planning department & Building standards are 2 separate departments, just because planning permission is not required does not mean that you are exempt from obtaining a building warrant or building regulations approval. A building warrant is required for nearly every construction project, large or small regardless if you are building an extension or knocking down a load bearing wall, or in this case a Loft conversion project. This is a hefty document of some 500+ pages. Below are some of the technical areas that require compliance with current Building standards. Structure – Required to withstand loads placed upon the new habitable space within your Loft. Fire – Fire resistance & separation to comply with the duration required, fire doors may be required etc. Environment – Drainage, sanitary facilities, heating, ventilation etc. Safety – Stairs, Electrical safety, etc. Noise – Noise separation, Noise reduction between rooms. Energy – Insulation, heating, lighting. The above will give you just a flavor of what is required for a Loft conversion, it might seem onerous, but all of this will make your new Loft conversion a comfortable, warm & well-ventilated space. Building warrant fees are set by the Scottish government and are therefore the same no matter what local authority is administering your building warrant. The fee is payable by you, direct to your local authority building standards department, the fee is directly related to the cost of your loft conversion project. Click below to work out your building warrant fee. 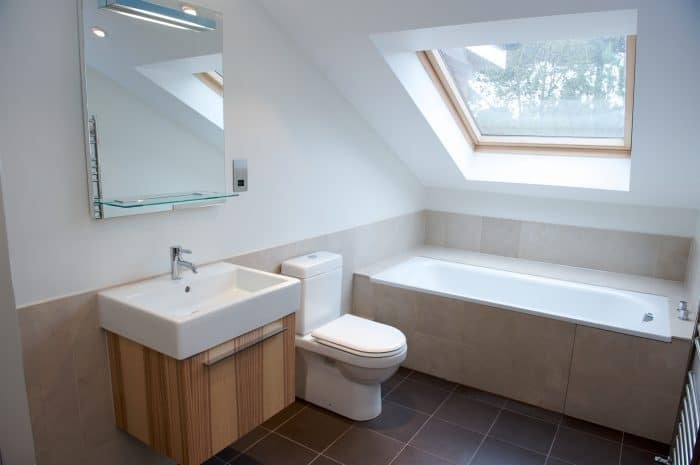 Bathroom conversion built into the eaves of a house with Velux roof windows providing light. Again, this guide cannot give you an exact figure as each project is unique and as such the cost will only apply to that specific project. As with any building project, many things influence the cost, the geographical location, the specification, and finish etc. How much do Loft Conversion Plans cost? The following costs are for a bungalow loft conversion, incorporating Velux Cabrio balcony windows, lounge area, bedroom area & bathroom. This project took 8 weeks to complete. Alternatively, if you are ready to move ahead with your project or would like to discuss your project further you can get your FREE 20 ‘Ask the Expert’ call.